Home / Not for sale / What is Chinese in contemporary Chinese art? 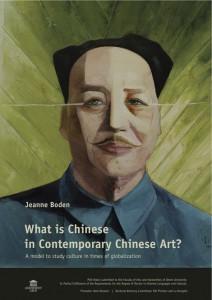 What is Chinese in contemporary Chinese art? Both Chinese and western critics who are acquainted with the Chinese context have argued that contemporary Chinese art cannot be understood by the simple application of western theories or the use of western art terms only. In essence, this criticism appears to imply that there exists something that is typical Chinese and that Chinese art and Chinese culture have Chineseness. Postcolonial theorists such as Edward Said (1978), Gayatri Spivak (1988), Homi Bhabha (1990) and Ella Shohat and Robert Stam (1994), have reacted against Eurocentrism in theory with its binary oppositions like center/margin, north/south, east/west, enlightened/ignorant, civilized/primitive, nations/tribes, religions/superstitions, culture/folklore, art/artifacts, and its overall simplification and generalization of the approach to post-colonial areas. Not surprisingly scholars researching Asia such as Kishore Mahbubani (1997), Naoki Sakai (1997), and de Bary (2007) have taken part in that post-colonial debate and have pinpointed Eurocentrism in the study of Asia in various domains. Many post-colonial theorists like Stuart Hall (1988), Rey Chow (2000), Shohat/Stam (1994), and Naoki Sakai (1997) have also reacted against the use of ethnic prefixes. Nevertheless, while various researchers have argued that reference to ethnic identity evokes associations with racism or dominance, Chinese artists and art critics themselves seem to have persistently used these prefixes in reference to China and Chinese culture specifically. This results in a situation where on the one hand the Chinese have reacted against Western dominance and on the other, have ostentatiously profiled themselves as being Chinese and by doing so have erected a barrier between China and the rest of the world or between Chinese culture and other cultures. As a result, while Eurocentrism can be detected in Western discourse, Sinocentrism can be detected in Chinese discourse. What exactly the concept of Chineseness consists of is impossible to tell. It can be described in different categories: linguistic, territorial, ethnic, or other. I choose to describe the term as ethnic or cultural identity. In investigating the East-West dialogue with issues such as post-colonialism, Eurocentrism, Sinocentrism and I developed a model to study Chineseness in the work of the Chinese artists who participated in Venice Biennale in 1993, which was the first time contemporary Chinese artists were invited in a structured way to an international art event. The research model explores the artists and their work in four main areas: 1. The relationship with the contemporary art scene in China after opening up; 2. The relationship with the Chinese government (art) discourse and policy; 3. The relationship with Western art and culture; 4.The relationship with Chinese art and cultural ‘shared traditions of descent’.